Virgil Ivan "Gus" Grissom (April 3, 1926 – January 27, 1967) was an American test pilot and astronaut. He was one of the original seven astronauts selected for NASA's Project Mercury in April 1959. On July 21, 1961, Grissom flew into space in the Liberty Bell 7 spacecraft. This was powered by a Redstone rocket. Grissom was the second American in space, following Alan Shepard. He made another space flight as command pilot (pilot in charge) of Gemini 3. This was the first trip by astronauts in NASA's Project Gemini. The trip took place on March 23, 1965. Grissom died along with fellow astronauts Ed White and Roger Chaffee during a test for the Apollo 1 mission at Cape Canaveral Air Force Station (then known as Cape Kennedy), Florida. He was the first of the Mercury Seven to die. ↑ Zornio, Mary C. "40th Anniversary of Mercury 7: Virgil Ivan "Gus" Grissom". NASA. Retrieved July 14, 2015. Bredeson, Carmen (1998). Gus Grissom: A Space Biography. Countdown to Space. Springfield, NJ: Enslow Publishers. ISBN 0-89490-974-6. LCCN 97-21343. Greenberger, Robert (2004). 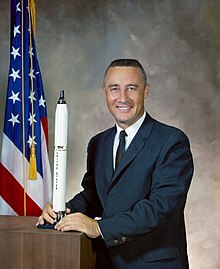 Gus Grissom: The Tragedy of Apollo 1. The Library of Astronaut Biographies. New York: The Rosen Publishing Group, Inc. ISBN 0-8239-4458-1. LCCN 2003011980. This page was last changed on 7 September 2018, at 13:45.